Frost and Dr. Andrew Bondy. step of the Pecs Pyramid to create full sentence). PECS begins with the exchange of simple icons but rapidly builds "sentence structure". -Binder features two interior storage pockets for loose materials. -Binder measures 8.5 x 5.5 convenient to travel and put in your child’s backpack or carry in hand. -Each picture measures 1.5 x 1.5 printed on 110 card-stock white paper and is heat laminated with the best 5 mil laminating paper to make it very sturdy. - Each Picture comes mounted with 1/2 round Velcro Loop (soft) coin attached in the back ready to use. -Each 5 colorful insert/divider is made out wear-resistant, tear-resistant, moisture-resistant poly material for long lasting performance. 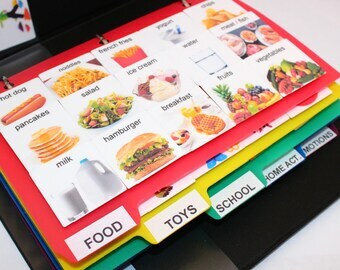 -Each insert/divider feature bright tabs with bold letters that stand out immediately for fingertip referencing. -Insert/divider comes with 3 strip of Velcro Hook (rough) attached to each side. 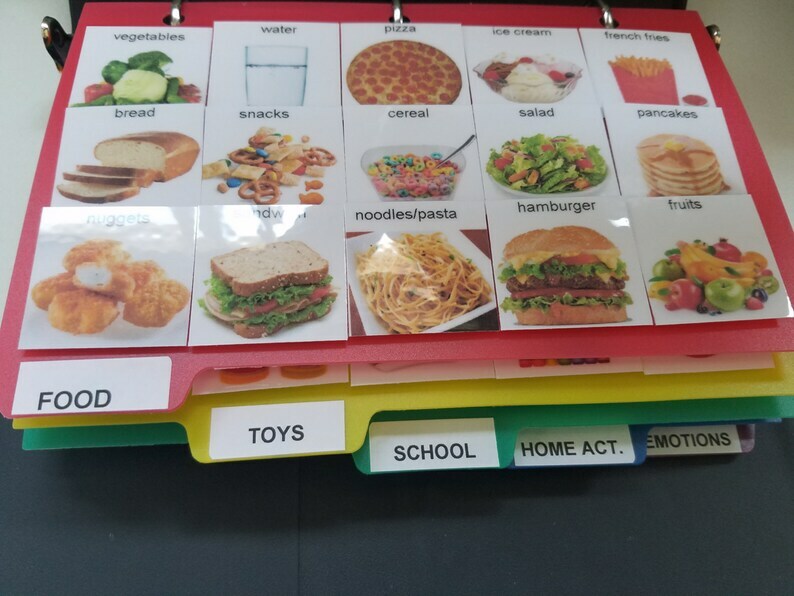 -The dividers make the binder extremely organized, each insert/divider is labeled by a category( 8 total categories) Toy, Food, Places to visit, School related, Home activities, Action verbs, Common Emotions and Sign language. Food (30) : cake, applesauce, yogurt, soup, candy, bread, jello, juice, water, fish crackers, snack foods, milk, ice cream, rice, sandwich, cereal, French fries, noodles, hamburger, salad, dinner, lunch, breakfast, pizza, meat/fish, fruits, pancakes, hot dog, vegetables, chips. Boy Toys (30) : Lego's, skateboard, toy train, trike, airplane toy, stacking toy, ball, bounce on ball, puzzle, action figures, coil toy, instruments, board game, little people, blocks, stuffed animals, crayons, play dough, toy phone, dinosaur, boat, potato toy, shape sorter, sand toys, trampoline, beads, sketching toy, toy cars, book, and bubbles. School (15) : play, lunch box, homework, library, recess, break time, motor skills, computer, sports, bus, circle time, school, class, paint, arts & crafts. Place to Go (15): store, zoo, park, museum, aquarium, trip, hair cut, swim, outside, doctor visit, party, theater, dentist, beach, special therapy. Signs (15): finished, go, stop, loud, help, quiet, I want, yes, no, please, want, my turn, your turn, more, all-done. Emotions (15) : surprise, embarrassed, happy, think, sad, proud, sick, tired, excited, disgusting, cold, mad, scared, hurt, hot. Action Verbs (15) : drink, build, listen to music, walk, write, throw, sing, share, dance, sit, run, jump, cut, blow, choose. !!! !Satisfaction Guarantee or your Money back!!!! We use the best Materials Guarantee !!!! Token economy system w/ real images pic card 4 children w/ Aspergers, autism, Aprexia: helps increase positive behavior & structured ed. SUPERMAN Token system w/ real images PECS card 4 children w/ Aspergers, autism, Aprexia: helps increase positive behavior & structured ed.